You’re a savvy e-commerce marketer and you’ve realized the tremendous value of Messenger Marketing. Nicely done. You may have even experienced first hand the fact that a Messenger subscriber drives 4-5x more revenue than an email subscriber, on average. Now the only question is how to build your Messenger subscriber list to capitalize on the opportunity. We’ve got you covered. We wrote this guide to both provide an overview of methods to opt-in Messenger Subscribers and also inspire some specific tactics that you can employ to quickly grow your Messenger list. First things first. Opting into Messenger is one-click simple for your customers. That’s why ShopMessage customers have an average 8% Messenger opt-in rate. That’s 2-3x higher than average email opt-in rates. Very cool. We recommend three ways to build your Messenger Subscriber List. We’ll dive into each. 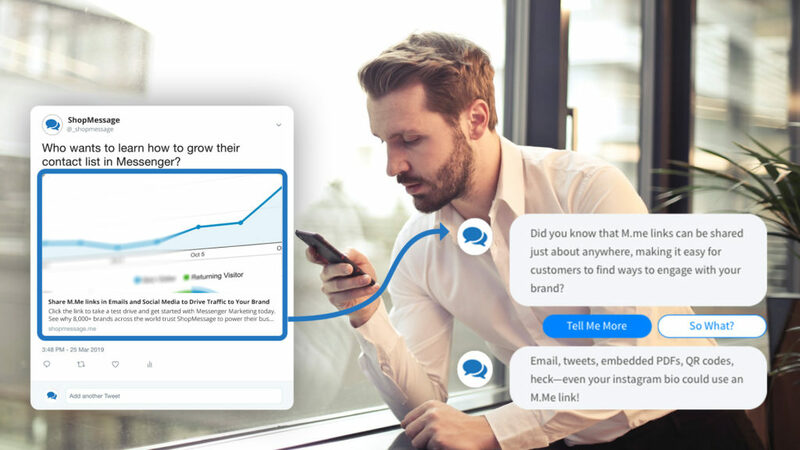 We can objectively say that ShopMessage has the industry’s most effective (and feature-rich) native growth tools for Messenger. And they’re included free with your ShopMessage account. 1. Smart Detection to Optimize Shopper Experience. ShopMessage Growth Tools optimize for customer experience by only appearing to users who are already logged into Facebook. Then opting-in is one-click simple. Plus, our Growth Tools never conflict with any other email capture tools thanks to built-in automatic detection, ensuring your customers are never inundated in popup hell. 2. Beautiful, Customizable Designs to Match Your Brand. For online retailers, brand matters. That’s why we offer dozens of beautifully designed templates, all of which are completely customizable. 3. Control Exactly Where and How Popups Appear. ShopMessage Growth Tools are flexible enough to only appear when shoppers go to specific pages or take specific actions. Our Growth Tools can appear as a full page takeover, a subtle nudge in the corner of a screen, and everything in between. And they can be set to appear when a shopper browses a specific product, when they check out, when they’re about to navigate away, or any time and place you set. ShopMessage’s Growth Tools let you prompt visitors at key points in their customer journey. Here are some of the most common strategies. You can easily mix and match strategies depending on your brand, customers, and whether or not you’re running existing email capture modals. ShopMessage growth tools prompt your visitors at key points in their journey. Maximize your impressions by presenting all eligible visitors (meaning visitors who are logged into Facebook) with an offer moments after arriving at your store. You can set this to display immediately upon arrival, although we would recommend a few seconds of delay, so your promotion benefits from the added surprise and delight of a well-timed offer. Use this strategy to strike a balance between your customer’s ability to browse the site and maximizing your opt-in rate. Purchase-Intent is defined as viewing the page for X-seconds, scrolling down Y% of the page, or adding an item to their cart. You can customize the timing and percentage delays based on your typical customer’s behavior. Wait to display your promotion until your customer appears to be navigating away from your store. Catching them on their way out could mean the difference between an abandoned cart and closing the sale. This is a subtle, yet visible way to build your Contact list that doesn’t take up a lot of space. This hybrid promotion will render as a pill in the bottom corner of your page until your customer engages with it, or an Intent rule is triggered. When this happens, the pill will expand into a modal, a flyout, or a full page takeover depending on what design you chose. This strategy is different because it targets the customer after they have completed their purchase. Use this to ensure opt-in collection by celebrating your customer with an offer they can save for their next visit. This strategy lays the foundation for building a repeat customer while they are still feeling the joy of their purchase. Ready to get started? Start your free trial today and have your first opt-in module live in 5 minutes. ShopMessage partners with the leading popup providers including Privy and JustUno to make it easy for customers to collect Messenger subscribers alongside email subscribers. ShopMessage works hand-in-hand with all your favorite email popup tools. If you’re like most eCommerce companies, you’ve been building your email list since day one so these strategies are old hat. Adding Facebook Messenger opt-in buttons to existing email opt-in popups takes just a couple steps (instructions vary slightly depending on the provider so check out our help center or contact ShopMessage support if we can assist). 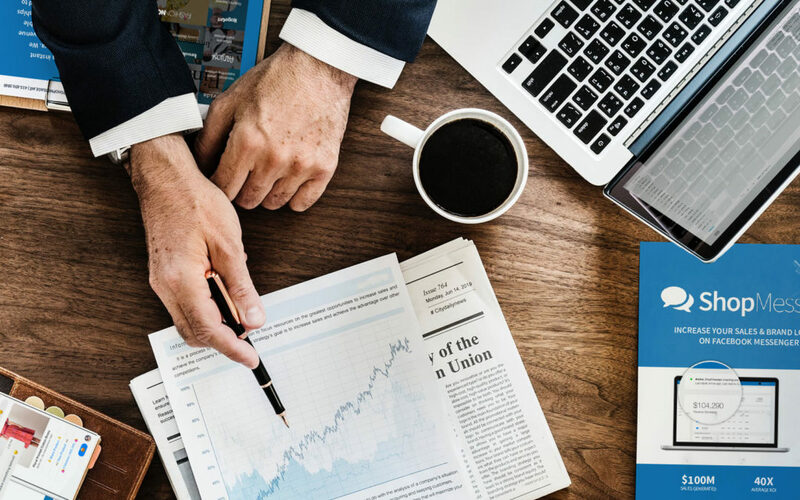 The advantage of integrating with your existing email capture tools is you can manage a single, unified opt-in experience and strive to capture both email and Messenger opt-ins at the same time. You can also use our partner’s popups in addition to native ShopMessage tools (Chapter 1) since ShopMessage popups are programmed to never appear on a page with an existing popup. Building a Messenger Subscriber list doesn’t end there. Conceptually, anytime you engage a customer in a Messenger conversation they can opt-in to future Messenger communication. So what are some ways you can start a Messenger chat? Run Click-to-Messenger ads on Facebook. Facebook makes it simple to launch an ad that directs people to a Messenger conversation instead of a website. The downside, of course, is you have to pay for the ad placement. But the upside is that the ad format offers a compelling way to interact with a potential buyer. 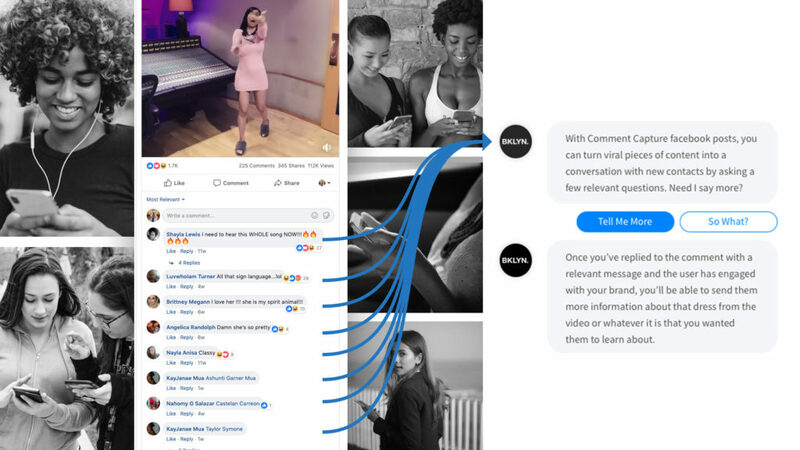 MVMT Watches, for example, used Click-to-Messenger ads to take shoppers to an interactive product guide on Messenger (and powered by ShopMessage). Share m.me short links to send people directly into a Messenger conversation. You can link to a specific Messenger message using an m.me short link. This can be especially effective if you’re running a giveaway or other promotion that encourages users to opt in. Plus, m.me links can be created and shared anywhere. For example, you can share the link over email to your most engaged customers. Or share it with your followers on a social media post . Use comment capture on Facebook posts. Use comment capture on Facebook posts to turn viral content into conversations. You’ve probably seen Facebook posts encouraging you to comment. You can use Facebook’s private replies API to automatically send a Messenger message to anyone who comments on your post, which gives you the opportunity to engage them in a Messenger conversation. Start Conversations with the Customer Chat Plugin. You can start conversations directly from your website with the Messenger Chat plugin. 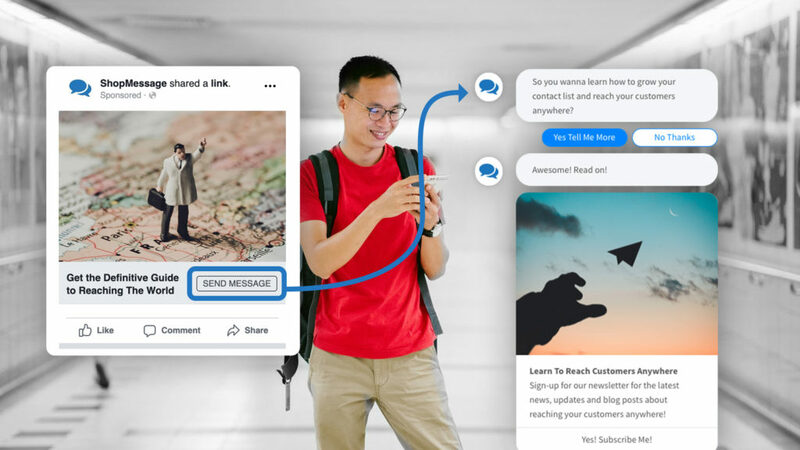 It’s a lot like other onsite chat plugins you’ve seen and interacted with, but since it’s powered by Facebook Messenger, you can continue the conversation even after the shopper leaves your site. Plus, everyone that engages with you in chat can choose to opt-into future messaging. Messenger subscribers are extremely valuable for e-commerce brands. There are many tactics you can employ to start building your list. The important thing is to get started.